A bustling port city on the mouth of an estuary in a large gulf on the Atlantic Ocean, La Coruña (Galician A Coruña) is one of northwest Spain’s beachy hot spots. More than sixty cruise ships a year call at La Coruña, confirming it as a great place to visit and launch a road trip to the rest of Galicia by La Coruña RV rentals. By getting a La Coruña motorhome rental in Spain, you do not have to deprive yourself of this great opportunity to explore the region that is one and a half times the size of Wales and is the green heart of Spain. Although the ‘playas’ of the Galicia coastline include some magnificent white sandy beaches fringing the Atlantic Ocean and the Bay of Biscay, they are certainly a great deal different from the ‘costas’ of southern Spain that lie alongside the Mediterranean. One of the best ways to see Galicia is in your La Coruña campervan hire is by following the most used and oldest pilgrimage route in Europe, El Camino de Santiago (the Way of Saint James). The route affords vistas of mountain villages and fishing towns which are steeped in history and can provide an excellent opportunity to sample the many different cuisines of the region, more than 30 of which hold the proud D.O. (designation of origin) label. About 15 minutes by campervan hire or motorhome rental from La Coruña is the town of Santa Cruz, which in 1594, in response to England’s Sir Francis Drake’s successful raids on La Coruña, fortified a whole island that is today a popular visitor destination. 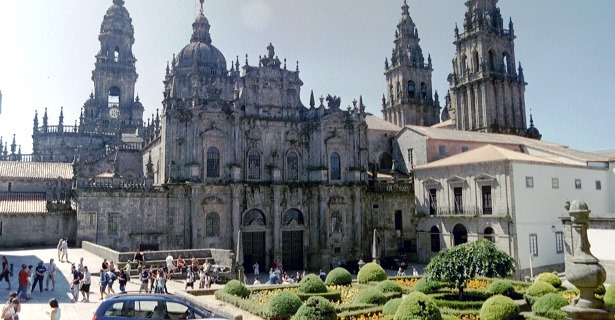 Driving your campervan rental in La Coruña two hours to the south will get you to Santiago de Compostela, one of the most beautiful of Galicia’s cities with its Baroque Cathedral and UNESCO-inscribed Old Town. In the main square you will find many hikers popping champagne, celebrating completing one of the venerated pilgrimage routes amid the buskers and other locals displaying their Celtic roots by playing bagpipes. Travelling farther south in your La Coruña motorhome rental, you will come to Pontevedra which is renowned for its old quarter that consists of a maze of streets connecting half a dozen squares. Heading east to Orense you pass through some magnificent scenery. Once you arrive, you can visit the “monumental district” where many of the city’s historic monuments are located, or visit the famous bridge which dates back to Roman times and is still 2,000 years old in places. Driving your campervan hire in La Coruña will allow you to go north from Orense to the city of Lugo which was built on a hill alongside the River Mino. Not only is this city, about an hour and a half north, known for its Roman remains (most notably its extant Roman walls) but also for its gastronomic cuisine largely made from sea food given Lugo’s location on Spain’s Atlantic coast.